On February 19, 2019, Sanders announced a second presidential campaign to win the Democratic nomination in the 2020 presidential election. On March 5, 2019, Sanders signed a formal statement, called a "loyalty pledge", saying that he is a member of the Democratic Party and will serve as a Democrat if elected. The day before, he had signed paperwork to run as an independent for re-election to his Senate seat in 2024. ↑ Sanders, Bernie. "Press Package". Sanders.Senate.gov. Retrieved June 5, 2015. ↑ 4.0 4.1 Peter Nicholas (July 26, 2016). "Bernie Sanders to return to the Senate as Independent". The Wall Street Journal.com. Retrieved July 28, 2016. ↑ 5.0 5.1 Blomquist, Dan; Robert Way (November 5, 2015). "Bernie Sanders files for Democratic ballot in N.H. primary". Boston Globe. ↑ 7.0 7.1 "Why Bernie Sanders is going to Alabama two weeks before the Iowa caucuses". Washington Post.com. January 18, 2016. Retrieved January 15, 2016. ↑ 8.0 8.1 8.2 8.3 8.4 8.5 8.6 8.7 8.8 "Bernie Sanders: Fast Facts". CNN.com. May 30, 2015. Retrieved June 8, 2015. ↑ 9.0 9.1 9.2 "Bernie Sanders confirms presidential run and damns America's inequities". The Guardian. Associated Press. April 29, 2015. Retrieved June 4, 2015. ↑ 13.0 13.1 Rappeport, Alan (April 29, 2015). "Bernie Sanders Announces He Is Running for President". The New York Times. Retrieved April 30, 2015. ↑ 14.0 14.1 Vicki Needham (December 12, 2014). ""Senate Democrats lock in key committee memberships."". The Hill. ↑ 19.0 19.1 Sofia Tesfaye (June 16, 2015). "America is feeling the Bern: Bernie Sanders draws overflow crowds — and surges in the polls". Salon.com. Retrieved June 16, 2015. ↑ 20.0 20.1 20.2 Seelye, Katherine Q. (25 June 2015). "New Hampshire Poll Shows Bernie Sanders in Dead Heat With Hillary Clinton". The New York Times. Retrieved 26 June 2015. ↑ 21.0 21.1 Jeff Zeleny (July 12, 2016). "Bernie Sanders endorses Hillary Clinton". CNN.com. Retrieved July 12, 2016. ↑ 22.0 22.1 "Democrats Nominate Hillary Clinton Despite Sharp Divisions". The New York Times.com. July 26, 2016. Retrieved July 26, 2016. ↑ 23.0 23.1 23.2 Guadiano, Nicole (July 15, 2016). "Bernie Sanders will launch organizations to spread progressive message". USA Today. USA Today. Retrieved July 27, 2016. ↑ 25.0 25.1 CNN, Gregory Krieg. "Bernie Sanders launches second presidential campaign". CNN. Retrieved 2019-02-19. ↑ 28.0 28.1 28.2 28.3 Leibovich, Mark (January 21, 2007). "The Socialist Senator". The New York Times Magazine. Retrieved July 18, 2007. ↑ 29.0 29.1 Stone, Kurt (2010). The Jews of Capitol Hill: A Compendium of Jewish Congressional Members. Scarecrow Press. p. 483. ↑ 37.0 37.1 37.2 "Sen. Bernard Sanders (I-Vt.)". RollCall.com. August 19, 2015. ↑ 41.0 41.1 41.2 41.3 "Leaving Brooklyn, Bernie Sanders Found Home In Vermont". NPR.Org. June 30, 2015. Retrieved July 1, 2015. ↑ 42.0 42.1 42.2 Steph Mochado (May 26, 2015). "Vermont's Sanders Kicks Off 2016 Bid From Clinton's Left". My Champlain Valley.com. Retrieved May 26, 2015. ↑ 43.0 43.1 43.2 Reynolds, David B. (1997). Democracy Unbound: Progressive Challenges to the Two Party System. South End Press. ISBN 978-0-89608-563-3. ↑ 44.0 44.1 Michael Kurse (June 15, 2016). "Bernie Sanders, The Early Years". Politico.com. Retrieved January 30, 2016. ↑ 46.0 46.1 "VT At-Large Race – Nov 08, 1988". Our Campaigns. Retrieved February 17, 2013. ↑ Daly, Christopher B. (November 11, 1990). 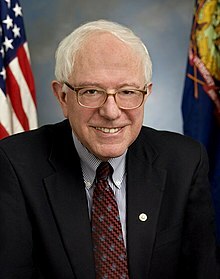 "For Vermont's Sanders, Victory Followed Long Path; First Socialist Elected to House in Decades Gets Attention With Frank Talk of Class Conflict". The Washington Post. Retrieved January 21, 2016. (Subscription required (help)). ↑ 54.0 54.1 Bernie Sanders (May 7, 2015). "Bernie Sanders: It's Time To End Orwellian Surveillance of Every American". Time. Retrieved May 19, 2015. ↑ 70.0 70.1 Bernie Sanders (November 11, 2016). "Bernie Sanders: Where the Democrats Go From Here". The New York Times. Retrieved November 14, 2016. ↑ 78.0 78.1 Gregory Krieg (June 11, 2017). "Sanders to faithful: Take down Trump, take over Democratic Party". CNN. Retrieved October 22, 2017. ↑ 79.0 79.1 Common Dreams staff. "The People's Summit: LIVE from Chicago". Common Dreams. Retrieved June 14, 2017. ↑ 80.0 80.1 "US bill on Russia sanctions prompts German, Austrian outcry". Deutsche Welle. June 15, 2017. ↑ 91.0 91.1 "Government shutdown: Where the senators stand". CNN. January 19, 2018. Retrieved January 23, 2018. ↑ 93.0 93.1 "Sanders cheers students protesting gun violence: 'We are very proud'". The Hill. March 14, 2018. Retrieved August 28, 2018. ↑ 95.0 95.1 Kampf-Lassin, Miles (May 9, 2018). "Bernie Sanders Has a Sweeping Plan to Expand Union Rights and Workplace Democracy". In These Times. Retrieved May 12, 2018. ↑ 98.0 98.1 "Bernie Sanders' 'Stop BEZOS' bill targets worker pay at Amazon and Walmart". CNN. September 7, 2018. Retrieved September 8, 2018. ↑ 100.0 100.1 Sylvia Lane (October 3, 2018). "Bernie Sanders Introduces Bill to Break Up Big Banks". The Hill. Retrieved October 9, 2018. ↑ 106.0 106.1 Jason Easerly (August 2, 2011). "Americans Love Socialism: Bernie Sanders Is The 3rd Most Popular US Senator". Politics USA. Archived from the original on November 20, 2012. Retrieved March 28, 2012. ↑ 111.0 111.1 "Bernie Sanders to Announce Presidential Bid on Thursday". NBCNews.com. April 28, 2015. Retrieved April 28, 2015. ↑ 112.0 112.1 Levine, Sam (April 28, 2015). "Bernie Sanders To Launch Presidential Campaign". The Huffington Post. Archived from the original on April 28, 2015. Retrieved April 28, 2015. ↑ 115.0 115.1 Tamara Keith (June 15, 2015). Bernie Sanders 'Stunned' By Large Crowds Showing Up For Him. NPR. Retrieved June 16, 2015. ↑ 119.0 119.1 Aaron Blake (June 20, 2016). "More young people voted for Bernie Sanders than Trump and Clinton combined — by a lot". The Washington Post. Retrieved July 2, 2017. ↑ 131.0 131.1 Veronica Stracqualursi (February 5, 2016). "Hillary Clinton Losing Her National Lead Over Bernie Sanders, Poll Shows". ABC News.com. Retrieved February 5, 2016. ↑ 134.0 134.1 Nick Corasaniti (21 January 2016). "Bernie Sanders, and Simon and Garfunkel, Put Focus on Voters". New York Times. Retrieved 22 January 2016. ↑ 138.0 138.1 138.2 "Bernie Sanders beats Hillary Clinton in stunning Michigan primary upset". The Guardian. ↑ 140.0 140.1 Johnson, Jenna; Berman, Mark (March 12, 2016). "Post Politics Skirmishes erupt after Trump cancels Chicago rally over security concerns". The Washington Post. Retrieved March 13, 2016. ↑ 143.0 143.1 Inae Oh (April 8, 2016). "Bernie Sanders to Speak at Vatican City About Social Justice". Mother Jones. Retrieved April 9, 2016. ↑ 145.0 145.1 Robert Reich. "Bernie Sanders". Time.com. ↑ 147.0 147.1 Melissa Herrmann (May 4, 2016). "How Bernie Sanders Scored an Upset in Indiana Primaries". CBS News.com. Retrieved May 7, 2016. ↑ 154.0 154.1 Jonathan Martin (July 24, 2016). "Debbie Wasserman Schultz to Resign D.N.C. Post". The New York Times.com. Retrieved July 24, 2016. ↑ 163.0 163.1 163.2 "Super Tuesday Results". The New York Times.com. March 1, 2016. Retrieved March 1, 2016. ↑ 176.0 176.1 176.2 Julia Bryan (March 21, 2016). "Democrats Abroad Primary Results". Democrats Abroad.org. Retrieved March 21, 2016. ↑ 177.0 177.1 177.2 Andrew Rafferty (March 22, 2016). "Sanders Wins Idaho and Utah While Clinton and Trump Take Arizona". NBC News.com. Retrieved March 23, 2016. ↑ 201.0 201.1 201.2 Associated Press (December 19, 2016). "The Latest: 3 Hawaii electors for Clinton, 1 for Sanders". WBTV. Retrieved 2016-12-20. ↑ 213.0 213.1 "What Bernie Sanders said when he was asked if he'd run for president in 2020". The Independent. 2017-01-12. Retrieved 2017-04-11. ↑ 230.0 230.1 Seitz-Wald, Alex (March 5, 2019). "Bernie Sanders signs DNC loyalty pledge: 'I am a member of the Democratic Party'". NBC News. Retrieved 7 March 2019. ↑ 231.0 231.1 231.2 231.3 Greenhouse, Emily (12 May 2015). "Getting to Know Jane Sanders, Wife of Bernie". Bloomberg. Retrieved 19 January 2016. ↑ 234.0 234.1 Seitz-Wald, Alex (28 May 2015). "The 25 best things we learned from Bernie Sanders' book". MSNBC. Retrieved 22 January 2016. ↑ 235.0 235.1 Joe Blevis (February 5, 2016). "Bernie Sanders has appeared in not one, but two low-budget rom-coms". A.V. Club.com. Retrieved February 5, 2016. ↑ 236.0 236.1 Meg Wagner (February 4, 2016). "Bernie Sanders plays rabbi Manny Shevitz in 1999 romantic comedy, goes on long-winded Brooklyn Dodgers rant". New York Daily News. Retrieved February 4, 2016. ↑ 237.0 237.1 "With A Little Help From Larry David, Bernie Sanders Does SNL". NPR.org. February 7, 2016. Retrieved February 7, 2016. ↑ 238.0 238.1 Markoe, Lauren (30 April 2015). "5 Faith Facts About Unabashedly Irreligious Bernie Sanders". The Huffington Post. Retrieved 7 June 2015. ↑ 246.0 246.1 "Bernie Sanders had skin cancer removed from his cheek". Business Insider. December 15, 2016. Retrieved March 6, 2017. ↑ 249.0 249.1 Jaffe, Harry (June 22, 2017). "Jane Sanders Lawyers Up". Politico. Retrieved 26 June 2017. ↑ 251.0 251.1 Ben Schreckinger and Jonathan Topaz (July 6, 2015). "The Socialist Surge". Politico.com. Retrieved August 18, 2015. ↑ 266.0 266.1 Tom LoBianco (November 16, 2015). "Bernie Sanders in Cleveland Talks ISIS". CNN.com. Retrieved November 21, 2015. This page was last changed on 8 April 2019, at 18:31.